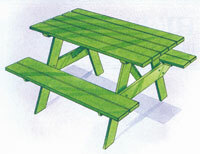 parts and painting patterns onto your timber. and erasable lines which won't bleed through paint. There are five rooms and a bath. Packet includes plan and white plastic "gingerbread" trim. Acetate windows, shingles and paper brick are no longer available. 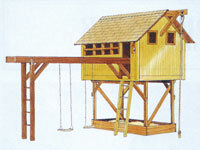 The roof lifts up to reveal a roomy attic. Access is from the front, making it easy to play with. 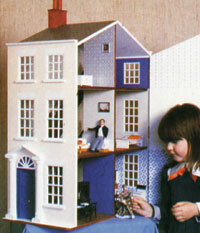 Three-story doll house with second-floor balcony and rooftop terrace. 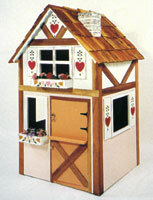 This unique five room doll house will be cherished by any little girl. 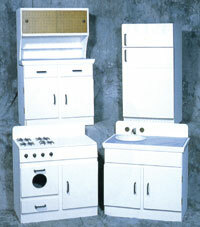 The fully illustrated plans also show full-size patterns for all the curved parts. The packet includes acetate windows, stick-on decorative details and window box flowers. Roof shingles are no longer available. 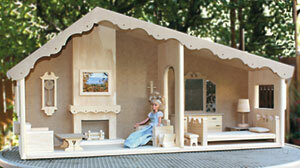 This unique five room doll house will be cherished by any little girl. 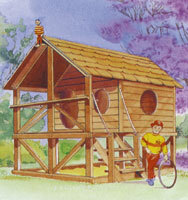 The fully illustrated plans also show full-size patterns for all the curved parts. For 11.5" dolls. Three rooms plus attic. 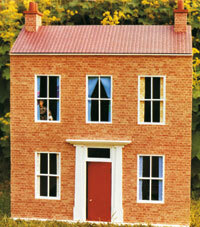 This twelfth scale dolls house is based on a style of Georgian terraced house to be found in many English towns. The right side hinges open to give access to six rooms on three floors connected by two stairways with handrails and banisters. 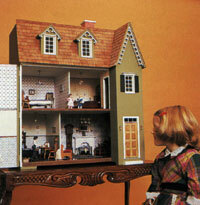 Every little girl's dream - her own doll's house. A double fronted Victorian country house with four rooms on two floors & a staircase. Full size plans & step by step instructions. Sturdy construction. Simple to make. Twelfth scale. In the mood of Ante-Bellum elegance and gracious living, this southern mansion has stately columns and traditional doorway. The main building is 42" W x 31" H x 26.5" D. There is a large foyer, dining room, kitchen and living room and the large chimneys provide many realistic settings for fireplaces. Upstairs there is an immense master bedroom, a bath and two smaller rooms. An attic provides storage and wiring access. If you want to build the other formal dining room and kitchen wing, this will provide space for a lovely library in the main house. 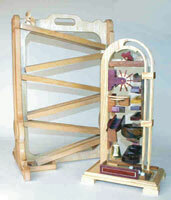 A deluxe house for 12" fashion dolls and it folds closed for carrying and easy storage. 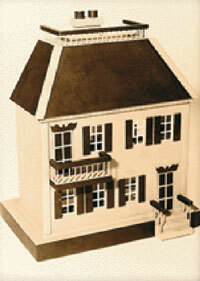 The Close and Carry Barbie House plan is an excellent project for building a compact, easy to move Barbie House. The built-in handle makes it easy to move around for play. 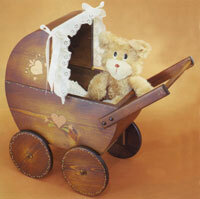 Afterwards it can be stored in a closet or on a dresser. It opens into a spacious home then opens further with yard extensions to the left and right. Easy to make shingles top the roof. The open house spans 6 feet. It all folds up into a compact case only 24" long, 16" deep and 18" high. 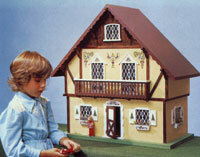 A two room house with a deluxe fireplace with logs and and irons, shutters & planter box by the windows (not shown), and a 13 piece furniture set. Most furniture patterns are full size. 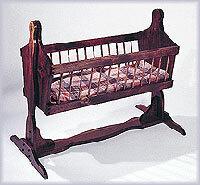 A Queen bed includes decorative headboards and a pillow fashioned from wood and an end bench. The house has a flat back so it can be mounted up on a wall for playroom beneath and out of the way. 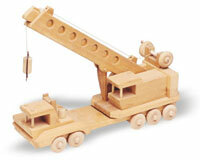 This spectacular wood product is the ultimate dream for young Barbie doll fanciers and collectors. The rear is open for access to spacious rooms ready for decorating as Queen Victoria may have done. Barbie and other fashion dolls are 11½” tall. 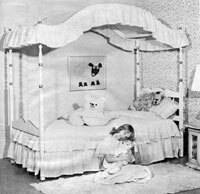 Standard Barbie doll house rooms are 14” high. And that is the case for the second level rooms on this house. 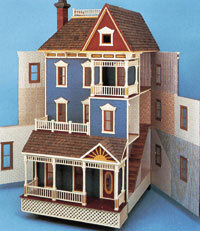 However the lower level rooms on the Victorian Barbie House are 17” high for a more spacious Victorian appearance. 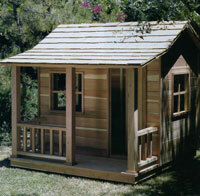 There is room for a parlor, kitchen, bath, and bedrooms. 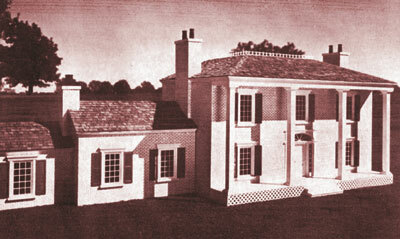 Four dozen windows envelop the house. Bay windows in the front and both sides extend the interior space. . Three large drawers in the back provide ample storage for Barbie accessories. Large photos come with the plan to better visualize finished parts and location. The fully assembled house is about the size of a two seat sofa for comparison. 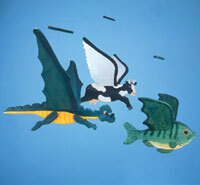 Overall size depending on options is near 60” wide x 49½” high x 39½” deep including the front court. The Victorian Barbie House plan is packed with detail and thus is an ambitious project and will be time intensive but will yield a major heirloom for Barbie collectors and architectural enthusiasts alike. 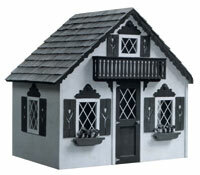 A popular design for a 1"=1' scale project inspired by the Black Forest houses in the South of Germany. 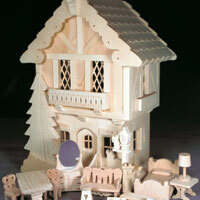 Full scale patterns are included for the deer, lamp post, gingerbread trim and the window grill work. 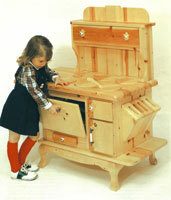 Thirteen wonderful furniture pieces reflect the whimsy from the movie “Heidi”. 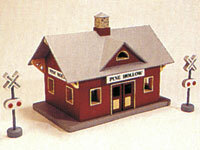 A charming house for miniature collectors. 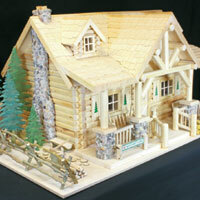 Deluxe miniature log cabin with over two dozen rustic furniture pieces and accessories inside and out plus a fun, five member bear family. 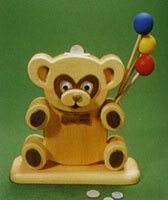 The Teddy Bear like figures have movable arms, legs and heads. 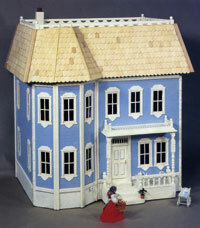 These beautiful birch dollhouse shingles are exactly what you need to add that special look to your minature dream home! 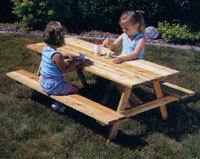 Put a light stain on them or leave them natural for that real wood effect. Each bag contains 400 individual shingles that are 1 1/2" x 3/4" which covers 225 sq inches. 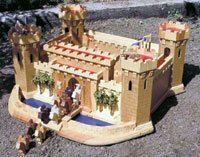 The detail captures the days of Camelot and Knights of the Roundtable. The plan includes towers with cathedral windows. Add optional lights for interior illumination. A catwalk encircles the perimeter. Crank the drawbridge to lower it over the mote. A grate lowers and raises in the entrance. 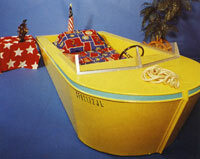 Flags, cannons, trees and a simulated rock wall are part of the detail. Kids love stacking the lumber and delivering the orders. Features garage, pumps, cars, truck and signs. 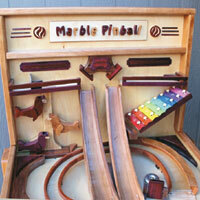 Marbles release every 2 seconds to cascade down and around a network of troughs, ramps and over a xylophone. They ring bells, spin paddles and trip levers. 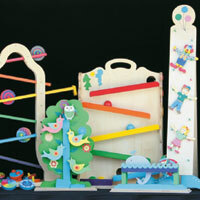 Children are captivated by the action of the fun, Rube Goldberg-like mechanism. Full size patterns. 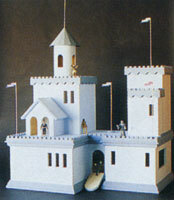 Tower based on the bell towers of Italy. 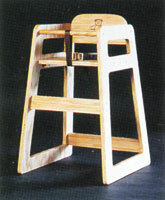 A unique wood crank elevates marbles up through an acrylic tube to the tower's loft to ring a bell. Marbles are switched to one of two pathways to chime more bells, sound a xylophone then swirl and zigzag over multiple pathways. 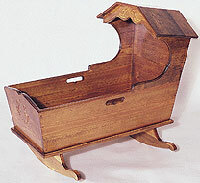 An heirloom wood project. 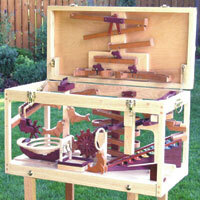 The marble game on the left is a basic double raceway, zigzag device. It has a handy launching lever at the top. 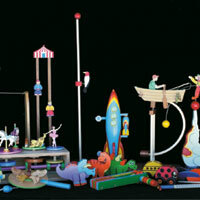 The marble device on the right is packed with fun, double action devices from top to bottom. Marbles are launched with a spring lever that propels them to the top inside of the right shaft. 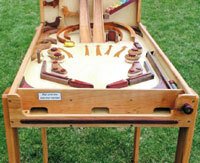 A two way switch directs marbles alternately down two sides to spin paddles, loop and swirl and strike a bell and more. Marbles make their way through a maze of switches and diverters directing marbles over a xylophone, around a spiral, through a zig-zag trail, a springboard and six other marble activated devices, all in the space of a chest the size of a common tool box. 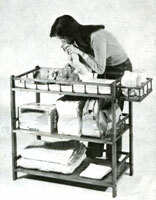 It closes for easy movement and storage. 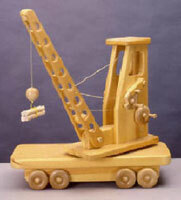 Measures 15" H x 26" W x 13" D.
A spring driven launcher fires marbles to the rear of the sizable play surface to ricochet through various wood obstacles including bumpers, ramps, bells, a spinner, and spiral. They can exit out holes where marbles drop to a second (hidden) level to strike bells then roll to the front to appear in the retrieval bin. Table length 40 1/2", table width 23 1/2", the height from the floor to the table’s highest point 39", height of the back panel above the table is 19". Plan is for all parts shown. Size 7" H x 17" L x 6" D.
Kris Kringle and eight tiny reindeer circle the village on a snowy yet full moon Christmas Eve. A snowman serves as the counterweight below as he looks skyward to welcome the jolly elf. 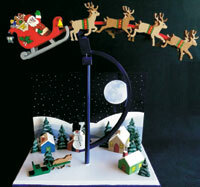 Santa’s arm waves and lanterns and bells sway as the sleigh and deer rock to and fro. Plan details everything shown here. 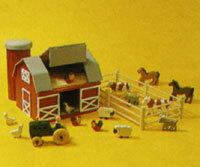 The silo is also a coin bank. 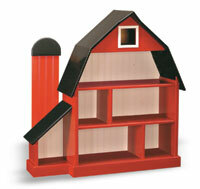 Barn is 10" H x 12" W x 9" D.
Designed with four to seven year old firefighters in mind. 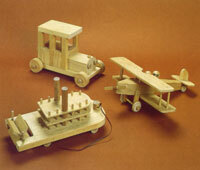 The plan incorporates a working steering mechanism and smooth pedal power. 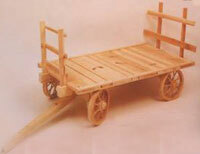 For a foot-powered truck a simple modification eliminates the drive mechanism. 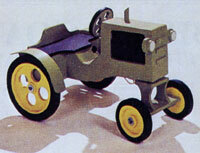 Designed for policemen aged four to seven. 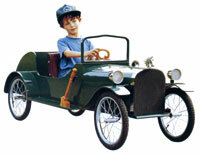 The car features working steering mechanism and smooth pedal power. 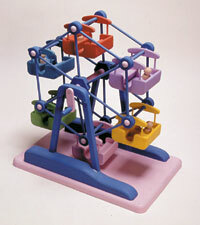 Children turn the crank handle and the ferris wheel rotates. 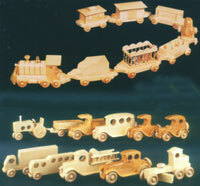 The six cars with wood people riders are free to swing to and fro. 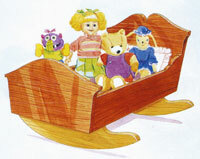 The Poppy (shown right) is a working pedal powered sports car which is suitable for children aged between four and eight years old. 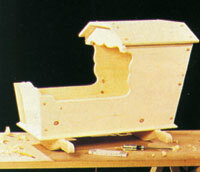 The body is a strong plywood and batten construction. Plan is in both imperial and metric. Metalwork is involved in making axles, steering arms and pedal linkages. These items are no longer available from the UK designers. 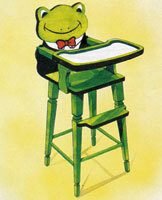 Ideal for children aged about four to eleven years. Designed for a 12V electric motor with a 25:1 reduction gearbox. Metalwork is involved in making axles, steering arms, pedal linkages and brakes. Electrical work is needed for wiring. 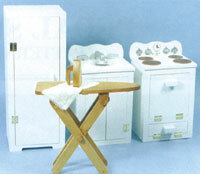 These items are no longer available from the UK designers. 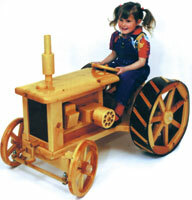 Sit on it, spin the steering wheel, "shift" the gears and pretend to sow the fields. Not pedal powered. Can be mounted on rockers. 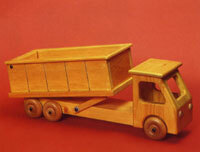 Children between the ages of four to eight love this sturdy dump truck because it actually works. Pull the lever at the side and the dump box tips. 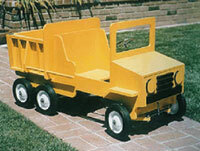 The truck can be pedal or foot powered. 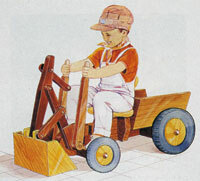 Plan includes instructions on how to make the steering and pedal mechanism. 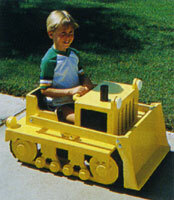 Children love this foot powered bulldozer because it actually works. A lever at the side raises and lowers the blade. 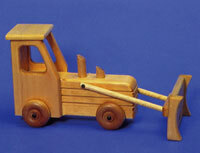 Children love this loader because it actually works. Steering with the feet, their hands are free to work the shovel. Pedal powered. Accessories available at bike shop. 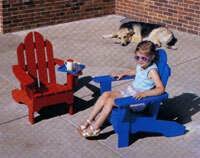 Sturdy design, has two position backrest to accommodate growing children. Includes tiger poster for applying to front. 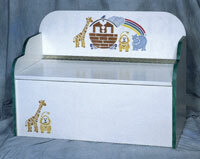 This sturdy toy chest and seat is easy to make. 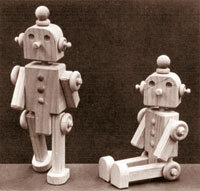 It consists only six pieces shown as full-size patterns. 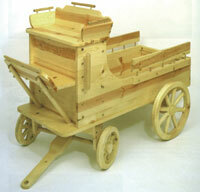 Kids will love playing farmer or pioneer with this replica of a real, old fashioned hay wagon. 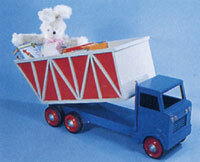 If you need another use, the hay wagon also looks great in the flower bed, yard, or garden! 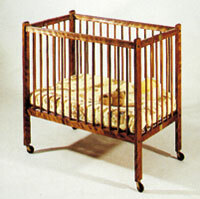 The bed height is 12", with an overall length of 53". The wagon is 28" wide. 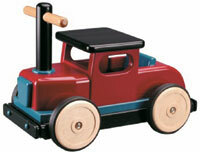 This popular truck is sturdy and will withstand generations of rough play. 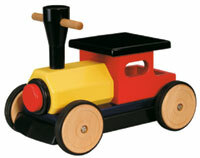 This great train is not the usual pull toy. 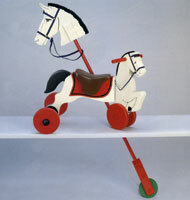 It is large and solid enough for a child to ride on. 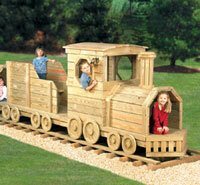 while the box car and caboose are each 20" L.
Full size plan to build this 6 car train. 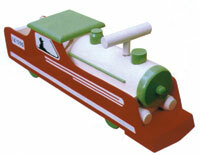 Each car can be coupled or used alone. 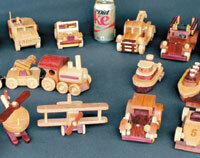 Set has engine, coal car, log carrier, crane, box car and caboose. Cars measures 8" long. 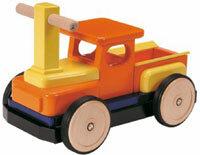 This 14-wheeler Log Hauling Truck will provide hours of enjoyment for the young lumberjacks of the family. One inch dowels are stuck together and form an integral part of the truck frame. 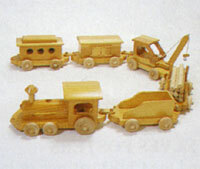 Five vehicles, each one has moving parts for working the ground. 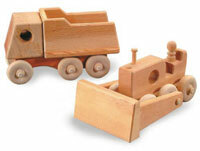 Truck with crane, dump truck, steam roller, shovel and grader. 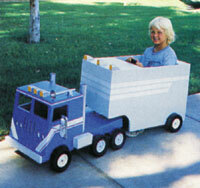 For reference the dump truck is 12” long x 5” high. 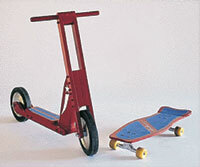 This is the first of two collections of some of the most fun action, balance and ramp toys in the toy world. 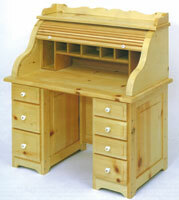 There are devices for the play room, or an executive’s desk. Nearly all patterns are full size. Every item is an action thriller. Three- five car trains and a trolley travel through Swiss farmland, over a trestle and into four tunnels. 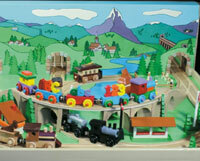 Features Swiss houses, a mill, water tower, a Swiss chapel, barn, clock tower and dozens of pine trees and grazing cows. 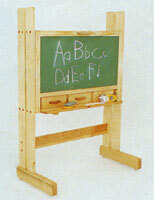 Open size: 52" wide, 29" deep, 9 1/2" high. Closed size: 29" wide, 25 1/4" high, 5 1/4" thick. 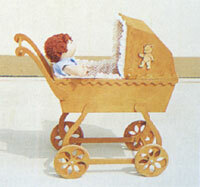 Patterns are full size with detailed cutting and assembly instructions. 28" L, 10" D, 11" H.
Tough enough to move mountains, An intermediate level project. 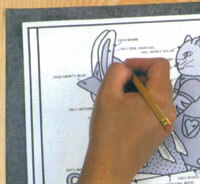 The plan details how to make the knobby tires. 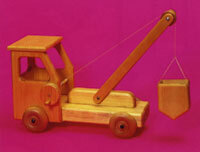 This front end loader measures 9" H x 16" L x 11" W. The bucket can be locked in the up position. 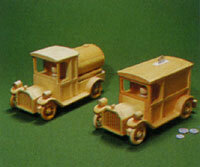 You can build this set of old fashioned hauling trucks from detailed full size patterns. One is dump truck, the other stake truck. 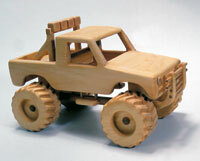 Build this big bad monster truck from the full size detailed plan. 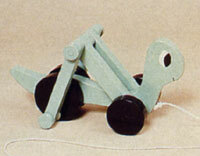 You will even make the monster wheels yourself following the pattern. 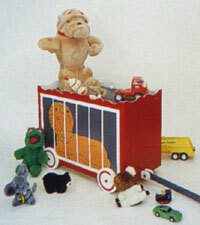 Full size plan to make this fun toy that features a top deck that lowers down to become a ramp for the vehicles to roll off. Hours of fun time play with this one. 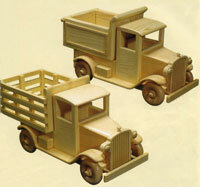 Plan details truck and vehicles. 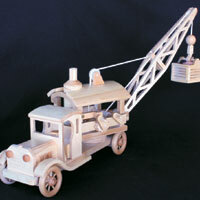 Big fun with this crane plan. 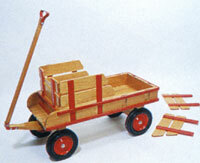 The cab swivels and the load can be raised and lowered. 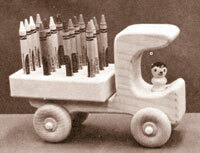 Ready to roll and hold a cargo of 16 crayons, this easy build toy plan measures 8" x 6". 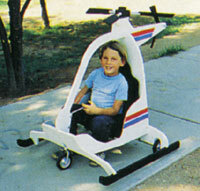 Two classic fun toys you can build, helicopter toy plan and race car plan are both easy to build and will provide lots of fun play time. Push him and his head bobs, legs move and humps go up and down. 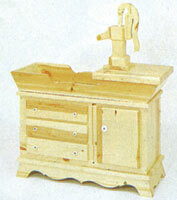 Trim kit has wheels, pegs, eyes, cams and back stacks. Our project plan to build this cute pull toy that moves along like an inch-worm, her back slinks up and down is quite easy to build. Ideal for toddlers. 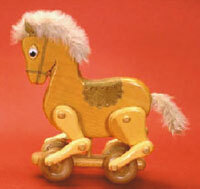 The ride-on pony has steerable front wheels and wide track rear wheels for stability. 30 delightful vehicle projects in one plan package. A great value even if building just a few of the vehicles. 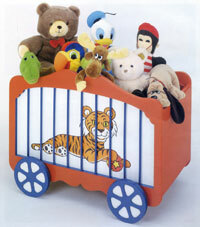 Children love them. 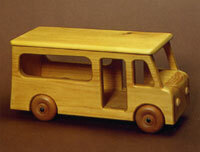 Easy, exciting projects for Christmas, birthdays or even as an accessory for a desktop, shelf or mantle. Train, boats and planes and more. Patterns are all full size. It's a way to utilize shop remnants. 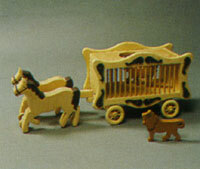 Maple toy wheels and axle pegs are available separately. 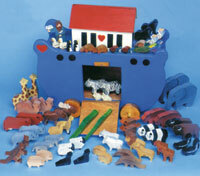 It has five carriages each transporting a different Australian animal. 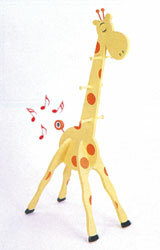 The animals stand 25cm tall. Pattern set includes two full-size patterns with complete instructions on how to make our eight piece Train that measures over 87" long and 11 Old Fashioned Vehicles that measure 6" to 10" long. 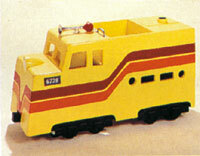 Plan shows engine, caboose and complete alphabet in 3" high letters. 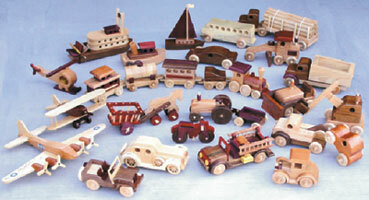 Just trace the shapes onto timber, cut them out and assemble. The grasshopper's legs move as he is pulled along. 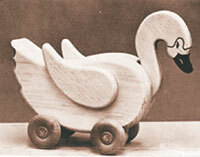 A fun push toy, this classic toy push duck, bobs its' head up and down as it is pushed along. Legs move in a "gallup" when pushed. Scooter is 41" long by 32" tall. Skateboard is 28". long by 10" wide. The construction is simple. 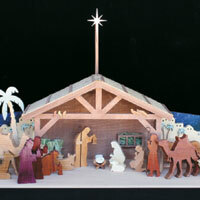 There are nine pieces of wood butted together and fastened with glue and screws. 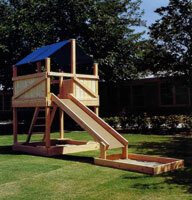 Features swings, monkey bars and a tidy sandpit below protected from the sun and rain. 6' x 8' house alone. 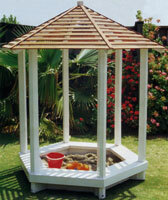 Features verandah and a sandpit below which protects children from sun and rain. 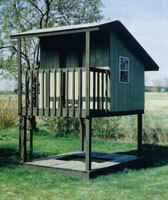 The floor of the playhouse is a safe 4.5' off the ground and the internal measurement is 6' square. The overall height is 10'. 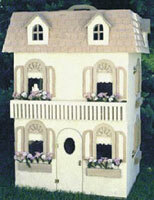 Has a fairy tale charm with it's ornate balcony, shutters and flower boxes. 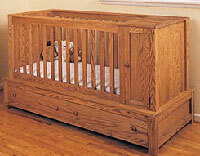 Included are full-size traceable patterns for the valance, shutters and flower boxes. 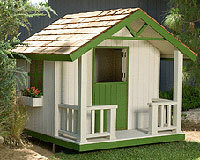 Measures 10' H x 8' W x 10' D.
Features a verandah that is protected from the sun and rain. 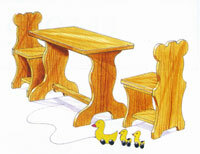 Measures 9.5' H x 13' W x 8.5' D.
Measures 7' H x 4' W x 4' D.
Measures 49" H x 33" W x 18" D.
Children love their own furniture. 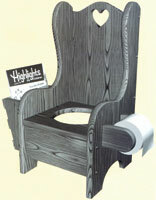 The chair is designed to incorporate a standard plastic potty bowl. 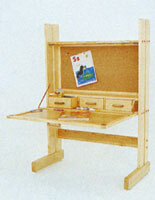 This is easy to build and paint as shown. They hang precariously from mouldings, shelves, furniture and even your computer monitor. Contains 19 different designs. 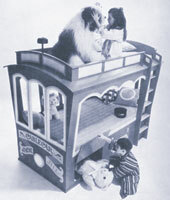 Deposit a coin and teddy plays a tune. 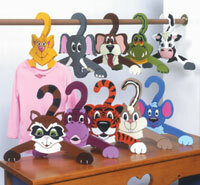 Kids will love to hang up their clothes with this colorful set of animal shaped hangers. 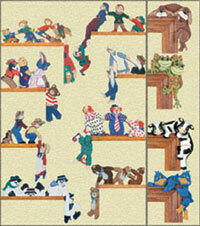 Make our Frog, Cow, Raccoon, Dog, Tiger, Cat, Mouse, Elephant, Monkey and Chipmunk hangers from one full-size pattern set. Fun and easy projects. 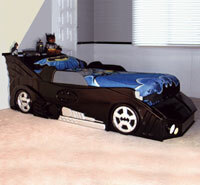 Any young child would be thrilled to sleep on this sleek red sports car bed. 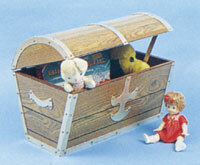 It features a useful book shelf and a hidden storage area. Bedtime will be a snap! 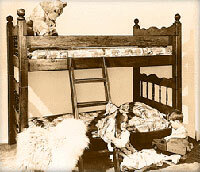 There is a step side platform on the rear of the bed so youngsters can step up to get in the back. Plus the roof gives the bed a real feel of a truck. 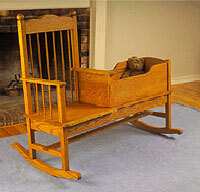 Small, light and sturdy, the cradle rocks freely with the touch of a toe, but the recurved rockers make it almost impossible to tip. 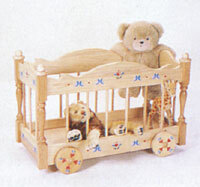 This easy to make cot is strong, portable and folds flat. 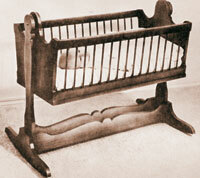 Pivoted to swing and mounted on rockers, it speeds baby to slumberland, and open sides admit air for sleeping comfort. 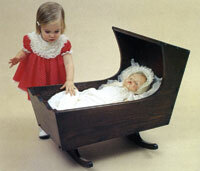 The cradle accommodates a standard baby-carriage pad.